The restaurant's food is partly organic and it all contributes to tasty, wholesome Welsh cuisine simply prepared from the finest ingredients. The restaurant is open to non-residents in the evening though booking is essential. Supper is served from 7pm and last orders go in to the kitchen at 8.30pm. Well-behaved children over the age of 10 are welcome in the restaurant but we do not serve a separate children's menu or do children's portions. Our menu changes daily but hopefully this sample will give you an idea of the type of food that we serve. 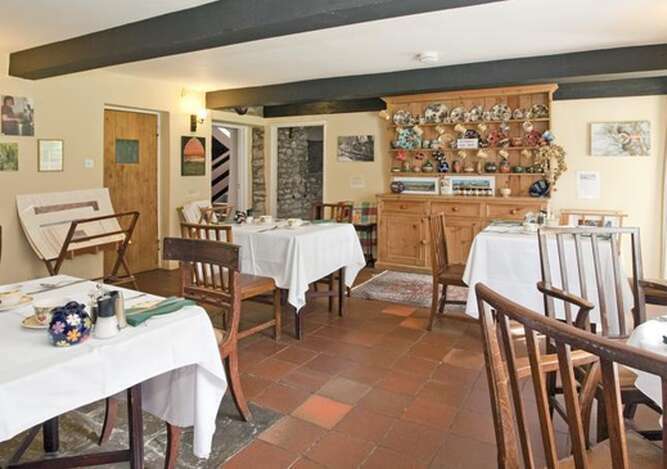 Wake up to a home cooked breakfast in the beautiful welsh countryside. We pride ourselves on our food at Ty Mawr and with as much of our food as possilbe locally sourced from around Carmarthenshire we are sure that you will enjoy the beginning of your day at Ty Mawr. Fresh fruit salad, cereals, local yoghurt, orange and apple juice are laid out on the welsh dresser for you to help yourself to. Annabel will be on hand to offer you a cafetiere of coffee or pot of tea from the large variety on offer. Steve will be busy in the kitchen preparing your cooked breakfast which is all freshly cooked to order. Our use of local welsh produce is integral to our approach to food at Ty Mawr. Steve, joint owner and chef, has excellent relationships with local suppliers so that they majority of ingredients for his dishes come from the Carmarthenshire. For example Welsh Black Beef comes from an organic farm 3 miles from the hotel that has won an award for its meat form the True Tast Wales Food and Drink Awards. For more information on our suppliers, click on the link below. All our wines are supplied by Celtic Wines from Pembroke Dock. They are not wines that you will find on the supermarket shelves and, though only a comparitively short list, we hope that there is something for everyone on it.